Death and taxes are certain, but not deductions. 1. Who Must File an IRS Form 706? 2. What Is Tax Form 712 Used For? Tax deductions can be worth more -- to someone else -- when you’re dead than alive. That’s because two filings must usually be made to the Internal Revenue Service on behalf of the deceased: one accounting for income from Jan. 1 through the date of death, and a second covering the resulting estate through the end of the year. The size and timing of final expenses can help determine if and when to claim them as deductions. Besides the standard Form 1040, the deceased’s spouse, another family member or court-appointed executor must submit Form 1041 if the estate grosses $600 or more in annual income. On the 1040, filers choose whether to deduct charitable donations and other qualifying expenses item by item from taxable income, or claim a standard deduction instead. For the tax year ending Dec. 31, 2012, the standard deduction is $5,950 for individuals and married persons filing separately, and $11,900 for married persons filing joint returns. In this case, the latter would include the income and deductions of the deceased through the date of death, and those of the surviving spouse for the full year. The standard deduction for a single head of household is $8,700. The full amount of a standard deduction can be claimed even if the person died on Jan. 1, making it potentially more desirable than it might have been in the deceased’s last full year alive. 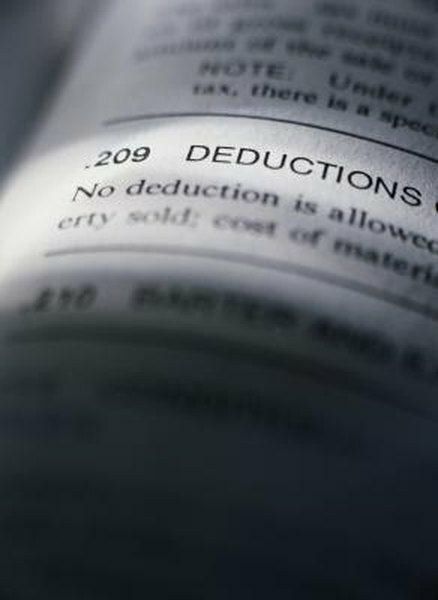 Even so, itemizing deductions on the final 1040 can quickly stack up as the money-wise option -- including personal medical expenses paid before death in most cases, as well as those for a spouse or dependent. Remaining medical expenses, which are liable to the estate, can be deducted in the amount that exceeds 7.5 per cent of adjusted gross income. Funeral expenses are not deductible on the 1040. Income generated by the estate of the deceased can work against itemized deductions. Insurance payments of medical expenses already deducted should be reported on Form 1041, for example. However, the filing is often unnecessary for IRAs directly inherited by beneficiaries, and in the case of property willed to direct heirs. Deductions of attorney and related administrative fees over 2 percent of adjusted gross income are deductible on Form 1041. A third filing, Form 706, is required for federal estate taxes (as opposed to estate income tax) if holdings were valued at $5,120,000 or more in 2012, including the value of individual gifts over $13,000 that would otherwise reduce the total figure. Assets inherited by the spouses of the deceased who are U.S. citizens are deducted from the amount, as are non-reimbursed medical and funeral expenses. Because the federal estate-tax rate is much higher, deductions that overlap the other filing categories are taken here wherever possible. Mike Volliger served as a business reporter for several newspapers for more than 16 years. His work has appeared in the "Chicago Tribune," "The Boston Globe" and "The Wall Street Journal." Volliger graduated from Yale College with a bachelor's degree in economics. Is a Trust or Life Insurance Better for Income Taxes? What Is a Fiduciary Income Tax Return?